June 15, 2012, is when I decided that I had enough of being lazy and unhappy. I found Bodyrock and the community of their app. I'm so happy I continued and didn't lose track or motivation. I used to start and then stop when it got too hard to fit into my life. Now it is a priority and is a HUGE part of my life as you can tell with this blog and facebook page. I'm so passionate about being healthy now. I used to make fun of people that ate salads haha. What a change! I'm going to go hard on Saturday and Sunday to make up for lost time =) I'm going to try to be good this weekend alcohol-wise (also because I can't afford it, HA!). All you need are chicken breasts and pesto. Pesto is fairly easy to make yourself - I recommend trying it =) I went with a store bought version though. It's basically pine nuts, basil, olive oil, and seasoning. Use thawed chicken. If I forget to take them out in the morning I put them in cold water while I'm having my after workout shower. They're usually pretty thawed by then - it's amazing! 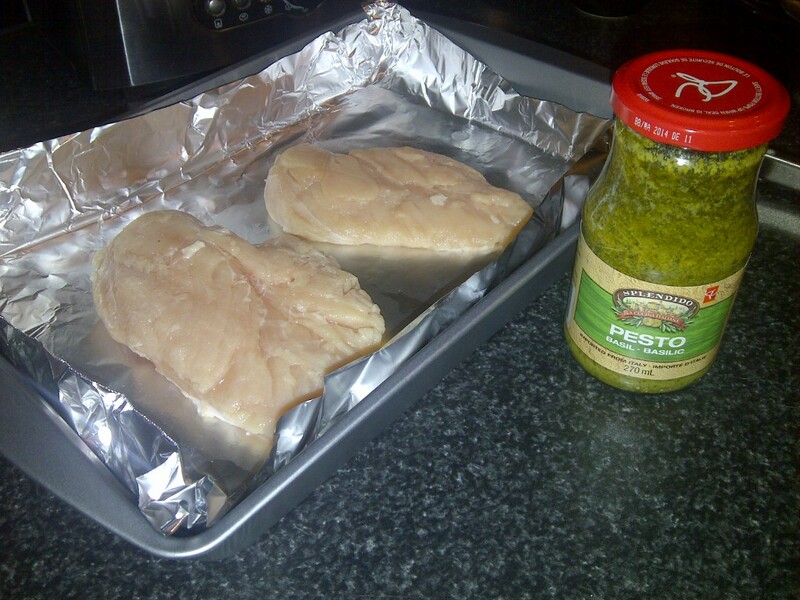 Preheat oven to 350F and use a spoon or brush to coat the chicken with pesto. Bake for 15 minutes and flip. Depending on your stove it can take between 10-15 minutes for the other side. Again, I love my meat thermometer because I'm so paranoid about meat. I bake my chicken to 170F-175F, even though it's safe at 165F. I enjoyed my chicken with edamame and 1/3c whole wheat penne noodles. I went shopping last week and haven't had time to post! I remembered to take a picture though. (I'll admit I put everything away and decided to take a picture haha). I bought a couple new things. I've decided I do not like eggplant. I've tried it a few times and it's just not my thing. I was super excited when I realized I had everything in my fridge tonight! The original recipe calls for feta but I don't have that so I used my skim milk mozzarella cheese. 1 mini cucumber1 large stalk of celeryhalf a tomatochopped onion1 tsp balsamic vinegar1 tsp olive oil I cut the cucumber in half lengthwise first then chopped into small pieces. If you want smaller pieces then cut half in half lengthwise a second time. Cut the celery down the middle lengthwise and chop as well. I already had my onion chopped in my fridge so I used about 3 tablespoons. Add more or less depending on your preference. Top with your dressing and mix up. I also added some Clubhouse Greek seasoning on top because I love that stuff with cucumbers and onions. I've decided I need to change my afternoon snack of cottage cheese and an apple. I managed to switch my morning snack to a delicious shake so I'm determined to do this change too lol. I seriously eat basically the exact same thing every day, except I swap out a few things here and there. If you follow me on Myfitnesspal you'll have noticed this too haha. So I just went through my Health and Self magazines, and Zuzka's website to get some new ideas. I HATE lists of ingredients. I like to keep things simple and really stick to under 5 ingredients - if that. My morning shake is: half a banana, 2-3 ice cubes, 1/2 frozen fruit, 1/3 cup non fat Greek yogurt, a handful of spinach, and 1/2 cup cold water. I realized today that I only posted once in June! I went camping with my family and aside from copious amounts of beer and some dessert I ate pretty good. Its funny because my appetite tends to be under better control when I'm away. I eat more when I'm sitting at my desk or at home and it's safe to say that it's caused by boredom. I'm trying very hard to keep my cravings under control while at work and eating bigger meals for breakfast, lunch, and dinner.